The great thing about our Magic products is that once you understand how each one works, you can apply it appropriately to many different clinical situations, beyond what’s written on the bottle. Only so much can be written on a product label, but I’m delighted to hear that my colleagues are finding unconventional uses for my products with equal efficacy. It is accepted among aromatherapists that if you don’t have to hand the oils which you would ideally use in a given situation, it may be worth simply using what you have. This may seem unscientific and slap-dash at first. However, when you consider that all essential oils contain a huge number of chemical constituents, each of which has its own therapeutic benefits, as well as a synergistic interaction with the other constituents, there is bound to be something helpful for most situations in any oil or oil blend, at least as an emergency stop gap. In my last post on Rescue Magic, I explained how it came to the rescue when I had the misfortune to sprain both ankles. This was what I had in mind when I designed it. However, a colleague and close friend of mine recently used it on a client with chronic sinus congestion. She explained that his face felt hot and that the sinuses felt generally inflamed and congested. Rescue Magic sprung to mind, because of its anti-inflammatory and decongestant properties. The effect was instant and the client left the room feeling much better, declaring that it was indeed Magic! 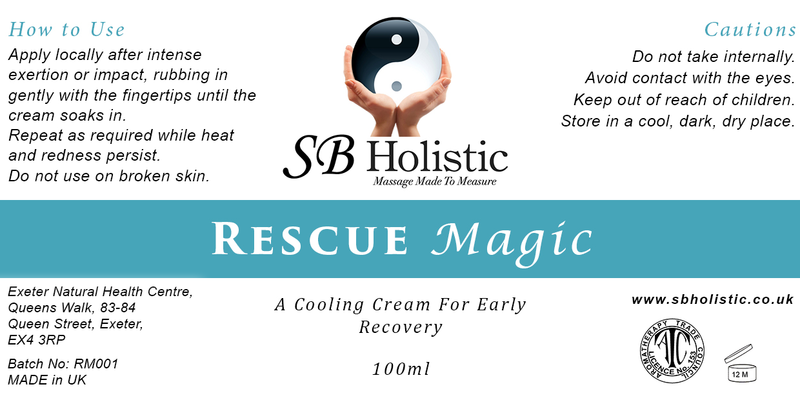 Rescue Magic contains peppermint, geranium, lavender and German chamomile, all of which are cooling and anti-inflammatory. Geranium is also a lymphatic decongestant and lavender generally aids circulation. All of these oils have an analgesic effect, because they contain alcohols. What else might you use this Magic cream for? Share your thoughts.